The great thing about using pumpkin in recipes is it offers plenty of health benefits. It contains lots of fiber (good for helping with weight loss), more potassium than a banana and beta-carotene to keep our skin looking marvelous! Last week. I made pumpkin pancakes (huge hit with my kids) and pumpkin soup. You'll find the soup recipe here on the blog and l'll be sharing the pancake recipe in this Sunday's Newsletter! Of course, it helps if you like pumpkin. Stating the obvious here but there's no point eating a food for health benefits if it makes you gag. 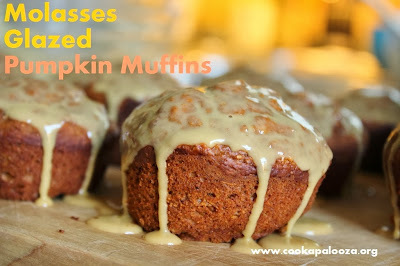 But if a sweet tasting pumpkin muffin with a molasses glaze sounds good to you, then read on! One cup of canned pumpkin goes into these muffins and that hardly puts a dent in the amount of pumpkin found in the can you see in the background. To ensure the remaining pumpkin doesn't go to waste, it's good to have another pumpkin recipe in mind before you start with this one. The Pumpkin Soup recipe I mentioned earlier will easily use it up. How do you like my orange bowl? 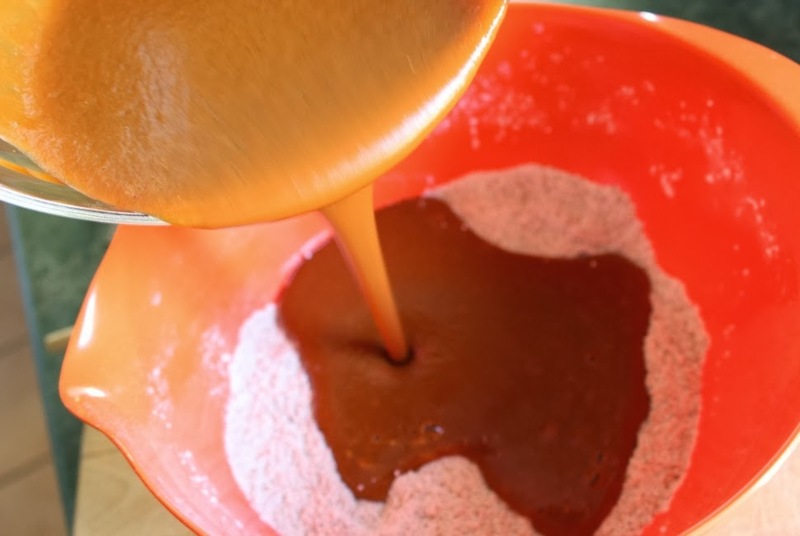 Matches the pumpkin mixture you'll add to the dry ingredients. Fold in with a rubber spatula. 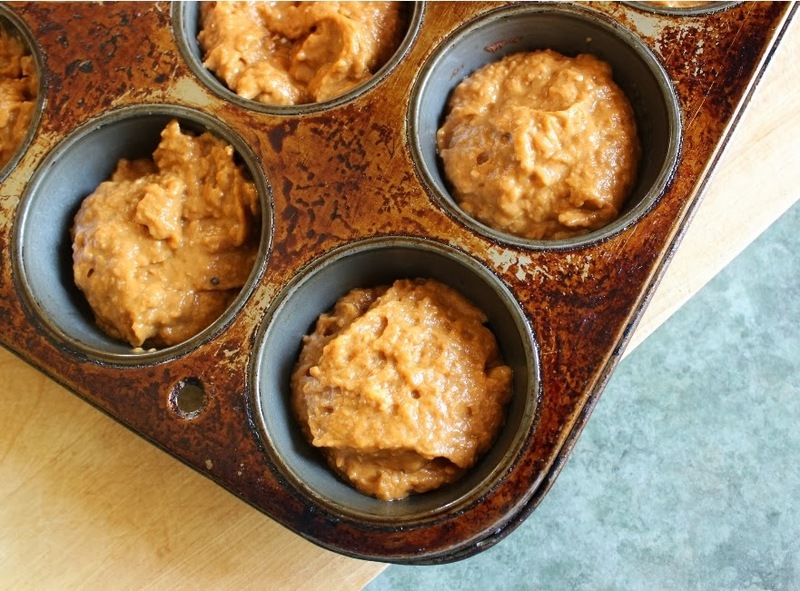 Once the batter is mixed, divvy it up among the cups in your muffin pan (looks like it's about time I retire mine and get a new one). Bake in a 350F oven for 18 to 20 minutes. When these good looking pumpkin muffins come out of your oven, remove them from the pan and let them completely cool on a wire rack before dipping in the glaze. 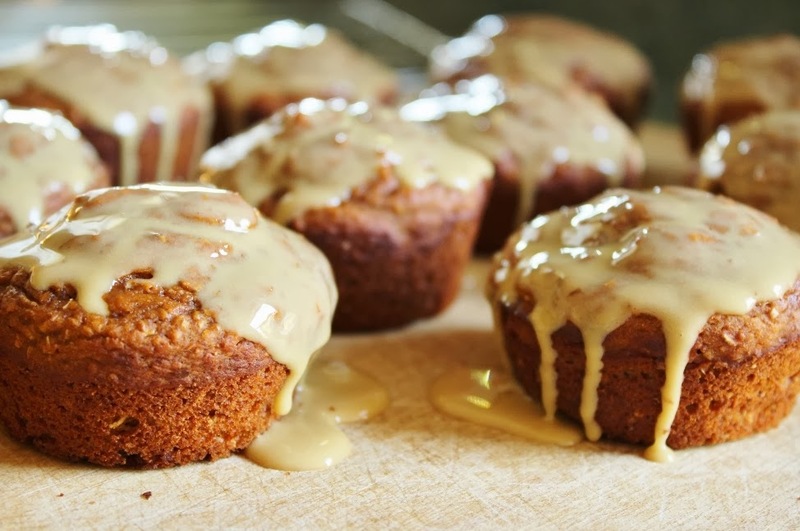 The glaze for these muffins is a combination of icing sugar, water and molasses. Another ingredient that would be good in here is a big pinch of cinnamon! 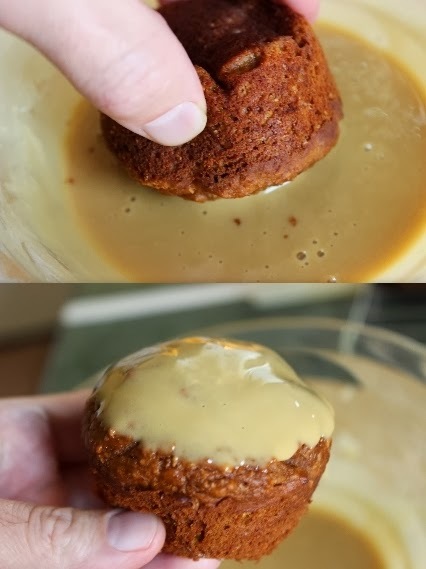 Once you've whisked the glaze into a thick paste, it's time for each muffin to take a dip in it! The best part is watching the glaze drip down the sides! Makes these muffins look and taste so good! Moist pumpkin muffins topped with a sweet molasses glaze. In a large bowl, combine flour, wheat bran, baking powder, baking soda, salt, cinnamon and ginger. In a medium bowl, combine pumpkin, eggs, brown sugar, yogurt, sugar, oil and vanilla. Whisk until smooth. 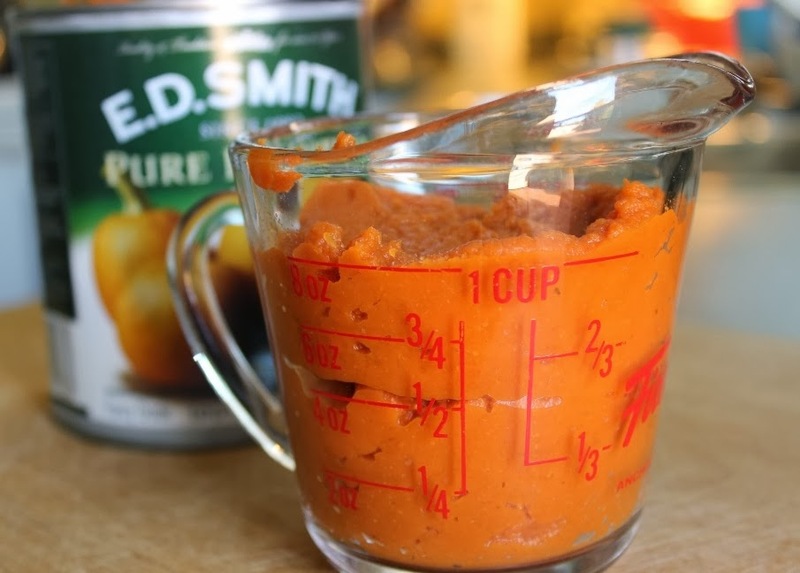 Add to dry ingredients and mix just until moistened. Divide batter among cups in muffin pan. 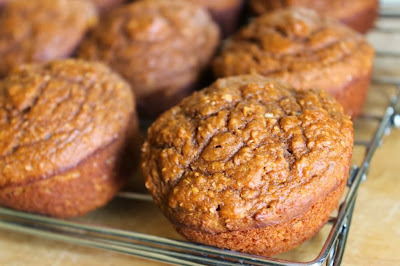 Bake in a 350F oven for 18 to 20 minutes or until a toothpick inserted in center of muffin comes out clean. Remove muffins from pan and let cool on a wire rack. In a medium bowl, whisk together powdered sugar, water and molasses to form a thick glaze (add more water as needed). 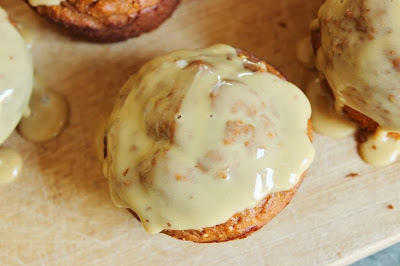 Dip muffin tops in glaze. Transfer to rack, allowing glaze to drip down sides. Let glaze set.